This course includes the book "Protecting Your Home from Radon," resource materials, and online questions. It provides 16 credit hours for both measurement and mitigation professionals. This course includes the book "Protecting Your Home from Radon," resource materials, and online questions. It provides 16 credit hours for both measurement and mitigation professionals. Whether you are a radon measurement or mitigation professional, you may find yourself sharing this valuable resource with your clients. There is approximately 16 hours of coursework, including the book "Protecting Your Home from Radon" and an online quiz (not timed and may be taken unlimited times). There is no time limit for taking the course, and even after completion you continue to have access to the course in order to refer back to resources. The Protecting Your Home from Radon Book is sent to you by Priority Mail (in the Continental U.S. only). 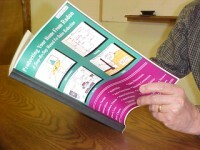 The cost of the book and shipping is included in the course registration. Mark said: Good refresher course for me. I learned a lot and my memory of the original training course was renewed. Christine said: The guide book was very informative and helped me better understand the process of mitigation. John said: Nice course with the ability to correct mistakes. Ruth said: Another excellent course! Billy said: Very good and informative. Layne said: Very useful and arranged well. John said: Great refresher and some items I did not know before. Ron said: This was a good refresher course! Mike said: Very through review. Patrick said: Always very thorough and to the point. Bryan said: great course and information. Richard said: Great course, useful information! Robert said: The course was very information and easy to work with. Jesse said: It was worth the money for the convenience.